Welcome to my series of bird photos. If you hover your mouse over the “Bird” Tab above you will see a list of categories under which I’ll gradually be uploading more images as I come across these delightful creatures in their natural habitat. 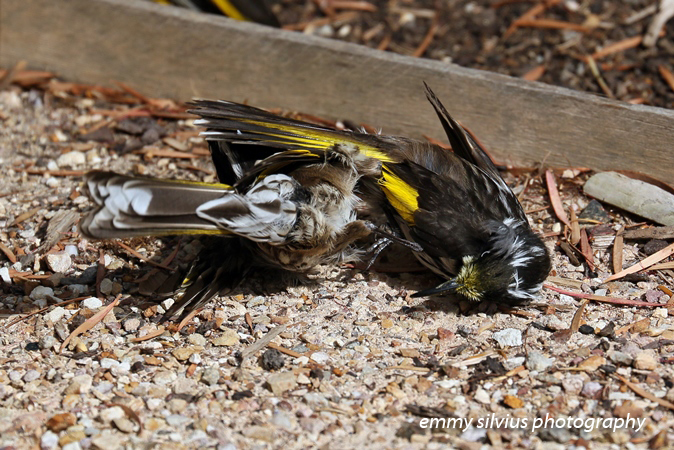 To kick-start my bird series I would like to share images taken in my back yard of young New Holland Honeyeaters engaging in what seemed to me to be some kind of frenzied wrestling match that lasted only a couple of minutes. Surprisingly none of them appeared harmed by the ordeal. I haven’t observed this happen previously or since so don’t know whether it is a common trait. If anyone can share some light on this I’d be very delighted to hear from you. The individual photos have been compiled into a video – please click here.